See Mom Smile: What does "tired" mean in your house? I have known for a long time that as words go, the same word can mean different things to different people. In my house, that is no different. Like when my kids say they will "clean" their room it means they will lay around in it for awhile, staring at the piles and make new ones. When they say they got their homework done it means they played 55 mins of video games and stared at it for 5 mins. (There is a lot of staring in kids's definitions). I have noticed that the word "tired" has the most varied definitions in my house, from mom and dad on down. When my hubby says he is tired, he actually means he needs to vegetate reading the newspaper or watch UFC. And when his head does hit his pillow he is asleep before I can say good-night. When my teenagers tell me they are tired it means they don't want to do chores or homework but have lots of energy to text, be on Facebook and watch TV. It means they will fall asleep within minutes of starting family scripture reading. It means they will whine continually when asked to do anything they don't want to do. When the two little boys are tired it means they can barely dress or undresss themselves, get up or down the stairs in less than 20 mins and need to fight and wrestle some more. And when the word "tired" is heard, it is interpreted in many different ways. When mom and dad are tired and actually in bed, to my usually monosyllabic speaking Man/Boy it means it is a good time to talk about girls, scout projects and his future. To 15 year old Sassy it means it is a good time to let us know about all the injustices she is suffering at the hands of her siblings and friends. And to 13 year old TanMan it means midnight is a good time to try on his newly acquired lacrosse helmet, walk into our bedroom, turn on the light and model it for us. My favorite "tired" is 5 year old JarBear tired. Too tired for a book (I can live without ISpying things for one night). Too tired to brush his teeth "It tickles my nose". 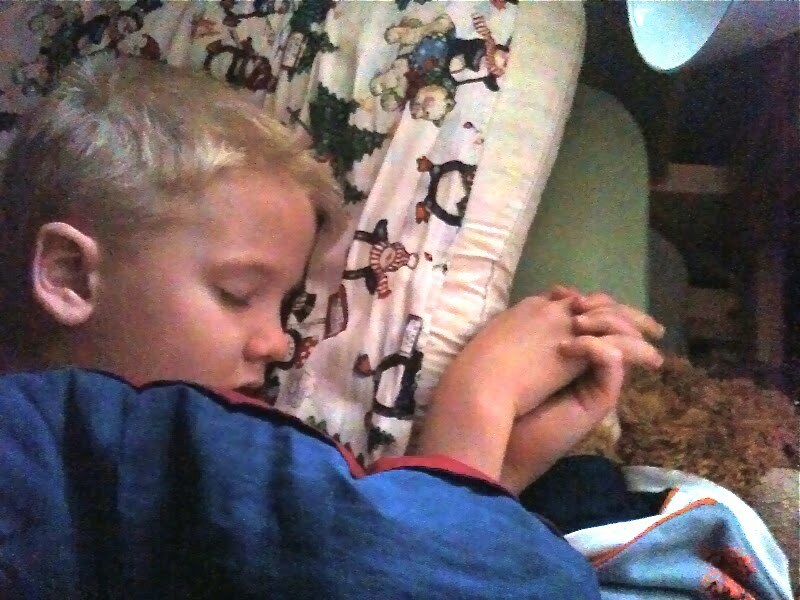 Too tired to say his own prayer, "Mommy you say it". He crawls into bed and is in dreamland before Veggie Tales gets through their first song. That is a tired I envy. I love that kind of tired and feel that way myself every day after preschool. I just wish I could have someone say my prayers for me, I usually nod off. JarBear tired is my kinda tired!! I love to go to bed like that! One you forgot...too tired to eat tired...that doesn't happen often, but I'm kinda grateful when it does!!! As long as I'm left alone!! "make it quick" hahahahahaha! Sooo funny, and oh so true. HAHA. I love it when my husband claims he knows how I feel. Ummm...no...you don't. haha. I have been plenty "too tired" this week myself, but allergies and a cold have really robbed me of good sleep. I'm hoping for a drop dead night of sleep tonight! Hey you need to jump on the journal "bandwagon" soon...I need three more journals pledged to read 100!~ cheers! Tired means vegging in front of the TV for 5 hours. I am tired and want to go home from work, but that probably means I will still be up until midnight. I feel as tired as your youngest one tonight! I wish I could be out as soon my head hit the pillow. Right now, I am too tired to go for a walk, but am fine to watch TV, comment on blogs, wander around my house looking for treats and shop for a cotton candy machine online. Or maybe even hop in the car and go to Target~even though I just got back from there. I might have missed something. By the way, I guess I DID sign up for Friday night at CBC, too! Who knew? How sweet!! That's the kind of tired I like, for me and my girls, both!! I am tired reading this, but in such a good way. "There is a lot of staring in a child's definition" Ha ha! So funny and true. I'm listening to my "tired" boys talk to each other in their beds. I'm threatening to turn out the hall light. It won't work. I'm too tired to go in and beat them. So many tired ways, so little sleep time. Good night! I totally get that kind of tired. I think I'm ALWAYS that kind of tired. It's the ability to be asleep like that and have no worries in the world that I envy. I yawned like 5 times during that post. Wait, not because it was boring! It was actually very thought provoking. Make it quick. Hahaha! When I'm tired it means if one more person talks to me or touches me or calls me mom I will literally burst into tears. HOW STINKIN CUTE! Tired is a word that my 4 year old does not understand. He went to bed way to late last night, (we had young women over for camp certification and I was busy) and he woke up way to early this morning, so now he feels like for lack of better words, crap! So he looks at me and explains why! Mommy I slept too much so I don't feel good. Just blog hopping and happened across your blog and thought I'd say hello!